The chapter describes research on the development of teaching and learning in a distance teacher education programme in Iceland. The focus is on challenges that school-based student teachers faced in learning to become online students and the way in which their experience of teaching in schools contributed to the development of teaching and learning in the programme. Cultural-historical activity theory was used for analysing the development of individuals and activity systems as a dialectical process. The expansive learning theory directed the contradiction analysis to reveal tensions and challenges in the development of practice within the programme, as well as future developmental possibilities. 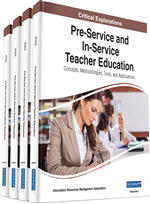 Data includes interviews with school-based student teachers and observation of face-to-face sessions, as well as transcriptions of online courses. Results indicate that a combination of non-traditional student groups and new online tools called for changed practice in teacher education and that a new model of teaching and learning is emerging. In order to develop this model, schools and the teacher education faculty need to look at the education of student teachers as a shared responsibility and negotiate acceptable arrangements for the institutions involved. Teacher education for compulsory teachers was launched in a distance programme at the Iceland University of Education (IUE) in 1993. During the early years most student teachers held positions as uncertified teachers in rural districts where there was a shortage of certified teachers (Jónasson, 1996; 2001). This research was conducted some ten years after the programme´s inception when admission to the programme had been opened to all students who preferred the online distance model rather than the conventional campus based model. However, school-based student teachers still represented a substantial part of the student group and the study focused on them. Special attention was given to how they could draw on their experience as school teachers when participating in the programme as student teachers and the way in which they contributed to development of teaching and learning within the programme. In the middle of the first decade of the twenty first century distance students constituted up to half the number of students enrolled in the programme. Despite these notable changes in the student population there was little discussion on the implications these changes had for the teacher education, such as changes in curriculum or development of teaching and learning as well as development of the programme at a system level. The aim of the chapter is to provide an insight into learning and teaching in the programme, and how the practices developed. How do school-based student teachers learn to participate and function in the distance programme and how does it relate to development of teaching and learning in the programme? How is the development of the distance programme interrelated with distance student teachers’ development as learners? What is the zone of proximal development for the distance teacher education programme? Lack of qualified teachers is a problem and alternative routes such as distance education have been explored to bring different populations into teacher education programmes, e.g. women in sparsely populated regions (Schwille & Dembélé, 2007). School-based student teachers have been given access to certification programmes where there is a shortage of qualified teachers and schools employ teachers without certification. This was the reason for the inception of distance teacher education in Iceland in 1993 when the Iceland University College of Education launched a full B.Ed. teacher education distance programme. At the beginning the setup assumed that student teachers would gather on campus in Reykjavík several weeks a year during school holidays while the distance learning sessions consisted of self-study with support from lecturers via the Internet, mainly through text based email communication. Ten years after launching the distance programme the university had placed an increasing emphasis on the compatibility of online and on-campus programmes. Regardless if taken at a distance or conventionally on campus, the programme was offered to all applicants irrespective of residence. In 2004, however the percentage of distance students living in rural districts was 57 percent (Kennaraháskóli Íslands, 2005) and a survey from that year shows that 42 percent of distance student teachers were employed as teachers in schools (Björnsdóttir, 2009). Despite the altered admission guidelines, the programme still served rural communities and met the need for uncertified teachers to gain a professional degree.